Although the calendar says winter, the trees and plants in San Francisco gardens are saying spring. With moist soils, sunny days, and lengthening daylight hours, every self-respecting summer-dry plant is getting into action immediately. In a few months, when the calendar says summer, dry soils, and cold, damp fog will make growing green very difficult. Our growing season is short and plants don’t waste a single day. As our plum trees on the streets start to bloom in cascades of pink blossoms and California Wild Lilacs (Ceanothus) flash blue on the hillsides, the weeds are growing just as enthusiastically. At GFE, our south orchard is full of Oxalis pes-caprae, otherwise known as sour grass. This horrible weed originated in South Africa in a climate so similar to ours that it has gone crazy in California, invading everywhere. Its bright yellow flower and clover-like leaves can be found on roadsides, in restored or disturbed natural areas, parks, and gardens. It is relentless and it never sleeps. Many a gardener has spent hours weeding this pest, only to come back a week later and find it fully re-established. So what can we do? Oxalis pes-caprae taking over the orchard. First, it’s important to know your enemy. Oxalis grows back so quickly because it stores energy in bulbs deep in the soil. A determined weeder can dig these out, but it’s slow, detailed work. In most situations, the oxalis is growing faster than this determined weeder can work. More commonly weeders remove only the above ground part of the plant. This can succeed with repeated weedings in the same year. Eventually the underground bulbs get exhausted of their stored energy if they have to continually regrow new tops. But more commonly, we gardeners get exhausted first. So it’s also important to know yourself and your garden. At GFE, we use different techniques in different parts of the garden to save our energy. In some featured parts of the garden, we weed for the bulbs, for example, in our vegetable production beds. These are oxalis-free, and if an oxalis plant started growing here, it would be immediately eradicated, no matter how long it took to find the bulbs. A second category is less-maintained but still very visible parts of the garden where we weed the tops, moving quickly. We keep oxalis in check, but don’t expect to eradicate it, because we aren’t removing the bulbs. Over the course of years, these parts of the garden have less and less oxalis (we hope). And then there’s the orchard, where we seldom weed the oxalis. And this year, we’re going to experiment with a new approach. Instead of removing the oxalis, which can be tricky on the steep eroding hillside, we are going to try planting groundcovers that can outcompete the oxalis. Here we’re looking for a tough perennial groundcover as tall or taller than the oxalis, that will form a thick mat of roots. This will make it hard for the oxalis to grow next spring. The groundcover will eventually form a sort of living sheet mulch. It will deter weeds, and help to fight erosion. We also need a plant that won’t become invasive itself. If we change our minds, or the groundcover seems to be taking too much water from the orchard trees, we want to be able to take it out again without too much trouble. It would be great if this plant had other benefits as well, so we’re going to try catmint, which will attract pollinators when it blooms, and also attract cats. The cats may eat a mouse or gopher as well when they hang out in the garden. In addition, the school kids can make cat toys to take home from their field trips. 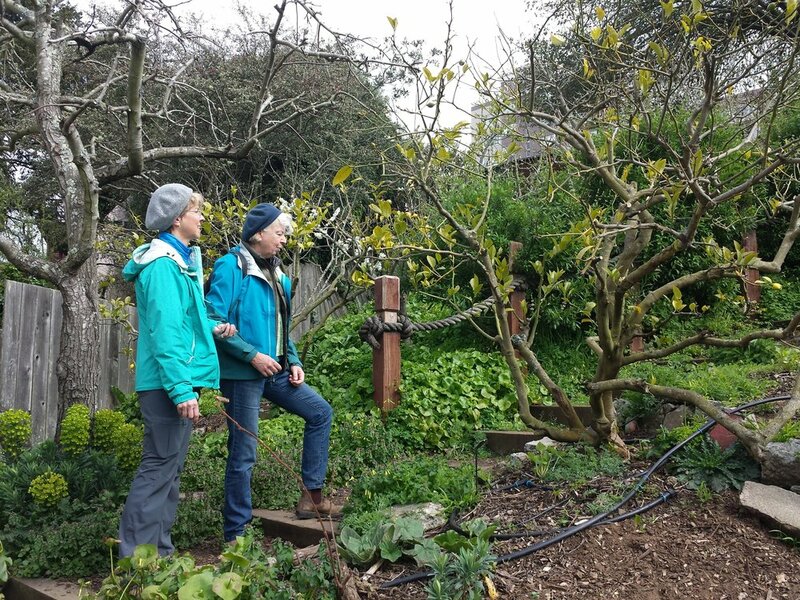 By interplanting our orchard with an understory that can outcompete weeds, attract beneficials, slow erosion, and provide a second harvest, we are using some of the best organic gardening practices. We’ll let you know how it goes! A garden visitor and Hilary looking over the sea of Oxalis and other weeds in the north orchard.